The notorious Mont Ventoux stands proud in Provence, southern France. Famous for its barren landscape and unrelenting heat, this is truly one of the great ‘classic climbs’. This unique trip offers the chance to summit Mont Ventoux for 3 days from 3 different routes, or, attack the mountain on day two of a three day ride with the aim of joining the Club des Cingles du Mont-Ventoux, climbing all three routes in one day. Reduced from £995 to £850 per person! Fly from the UK to Marseille airport, with a transfer to the town of Vaison-la-Romaine where we will be based for the next few days. Flight times permitting, a warm up ride follows in the afternoon, before heading back for dinner and a good night’s sleep. After an early breakfast, briefing and the ceremonial handing over of the “cingle brevet” card and plate to affix to your bicycle, you will be heading to the start at the base of Mont Ventoux. The first climb starts off from Malaucène which has an average gradient of 7.2% over 21km ascending to 1550m. Once your first ascent has been completed it is down to Sault to attempt the second ascent. This side is regarded as the easier ascent because over the first 20km there is an average gradient of 3.6%. With every uphill there is a downhill, and we are soon on our way back down. The third and final route up is regarded as the classic way up the mountain from Bedouin. With an average gradient of 7.5% over 21.5km, you will be hoping for a tail wind to get you over the last few kilometres as you pass the Simpson Memorial. Once you have reached the top for a third and final time you will be able to take in the view and appreciate your exertions and achievements. The final descent is down to the base at Malaucene and the short journey back to the hotel, where you can toast your achievements. For a warm down after yesterday’s exertions we head south, towards the town of Carpentras. The route will look familiar as you enter the town of Malaucène. The rolling hills at the foot of Ventoux act as reminder of yesterday’s achievements. The route crosses back and forth over the L’Ouveze river with amazing views throughout of the Beast of Provence. We arrive back to our hotel for a well-earned shower and meal before the transfer back to Marseille airport. Fly from the UK to Marseille Airport, with a transfer to the town of Vaison-la-Romaine where we will be based for the next few days. Bike assembly over lunch with the help of our guides followed by a climb briefing, and then we’re off to clock our first ascent up Mont Ventoux via Malaucène. The roads are wide until we get to the town and then start to narrow the higher we go. Soon we break out of the forests and are on the bleak climb up what will become so familiar in the next 3 days. 61k later we are back at the hotel for a good meal having got one ascent in the bag. We have all day to do what Contador and Armstrong did in under 50 minutes – the summit of Mont Ventoux from the Bedoin side. 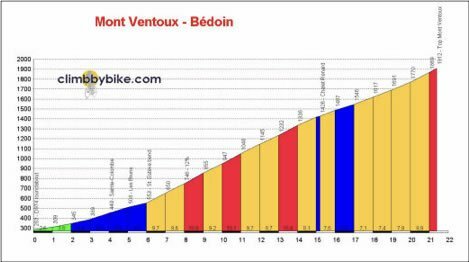 After a suitable breakfast, we head off along the foot hills to the village of Bedoin, the true home of the Tour de France on Mont Ventoux. From here, we once again start up the rough Provencal road with fields on either side and wild flowers on the verges. As the road steepens we head into the forests which cover the lower levels of the mountain. We pass the names of the greats like Marco Pantani scrawled in chalk on the road, and the chalk “cheers” to international teams get more numerous as the trees thin out at the famous Chalet Reynard. From here we are once again totally exposed to the elements as we make our bid for the top. After photos with backdrops that stretch for miles around we head back down the Beast via Malaucene, the most direct route to the hotel, a shower and dinner. Our last attempt at the summit bid is via Sault. For this we take the most intimidating of roads to the north of Mont Ventoux to get to the eastern side and Sault. The fields of lavender that Provence is so famous for are very evident here. Leaving the little village of Sault behind we head up the west flank of the Beast on gentle uphills until we hit Chalet Reynard again. After we have summitted Mont Ventoux for the 3rd and final time in 3 days we take the same route down as the day before, direct through Malaucene to our hotel for a meal and the transfer back to Marseille for the flight home. There are no flights included in your package price. These are the recommended flights which the group transfer will be meeting. If you wish to book different flights and therefore miss the group transfer, you will need to make your own way to the hotel/airport. Please confirm which flight you have booked so we can accommodate you on the transfers. pie are unique in the industry offering only bespoke guided rides for companies, charities and groups of individuals. Both routes are fully supported with guides at a ratio of one guide to 10 cyclists, support vehicles, tour leaders/drivers. Each day you will get breakfast at the hotel before setting off, morning and afternoon refreshment stops while on the ride, a substantial lunch plus dinner and twin room accommodation each night. While riding water, gels and electrolyte tablets are available from the support vehicles. The event is a guided ride with groups being led by pie guides who are familiar with the terrain and who help all abilities complete the challenge. In an age where independence rather than group cycling is heralded, those not familiar with the pie guiding system may be reluctant to follow rather than lead. We have set up a Strava “club” for the Ventoux 3 Ways bike ride. The link will be sent to you when you sign up. If you have already got a personal Strava account you can just log on using the link we will send, join the Ventoux 3 Ways “club” and start your training with other cyclists. If you haven’t got a Strava account, simply enter your details in the “Sign Up for Free” section on Strava. Don’t be daunted by the leader board and other people’s fast times. Payment – Reduced from £995 to £850 per person! There are 3 payment options. First option is to pay £295 deposit by cheque or BACS (please contact us for details: tina@pieevents.co.uk). The balance of £555 is payable by cheque or BACS by 5th July 2018. All payments are non–refundable. Please therefore take out suitable travel insurance should you need to cancel for an insurable reason. If you are signing up 10 weeks before departure or less, please pay the £850 in full.